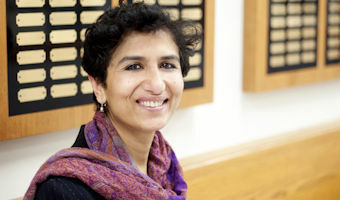 The Physics & Astronomy Colloquium Series presents Chandralekha Singh, Director of the Discipline-Based Science Education Research Center and Professor of Physics at the University of Pittsburgh, on Wednesday, Nov. 7, at 4 p.m. in Edwards Accelerator Lab, Roger W. Finlay Conference Room. If you are interested in teaching as a part of your future career, you should make the time to come to this seminar if simply to get an idea of the kind of research that is going on in the PER community that can be used to help guide your future teaching. Abstract: In this seminar, I will discuss my research in physics education that has implications for helping students learn physics more effectively. One study shows that the difficulty of a problem not only depends on its inherent complexity but also on the familiarity and intuition one has developed about it. I will also discuss research focused on asking students in introductory and advanced courses to diagnose their mistakes. I will also present data that suggest that female students face additional hurdles in physics courses and discuss strategies to improve learning for all students.